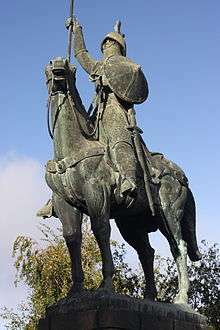 Vímara Peres[lower-alpha 1] (Vímara Pérez in Spanish; died in Galicia, 873) was a ninth-century nobleman from the Kingdom of Asturias and the first ruler of the County of Portugal. ↑ Vímara is an originally Visigothic name of Germanic origin (cognate with Weimar or Guimar) and Peres is a patronymic, meaning son of Pedro or Peter. The name can then be equated to Weimar/Guimar Peterson. ↑ Audivia was the daughter of a Vimara and Trudildi. Although the name of Vímara's wife is not recorded, Audivia, married to count Gutierre Aloítez (died after 963) is recorded as being the daughter of a Vímara and Trudildi, a name quite frequent among the nobility of Portugal and Galicia in the middle of the 10th-century. Historian Margarita Torres Sevilla-Quiñones de León believes that Audivia, for chronological reasons and because Vímara was an uncommon name, was the daughter of Count Vímara Peres and that Vímara's wife could have been this Trudildi. 1 2 3 Mattoso 1981, p. 106. ↑ Miguens Narvaiz 2010, pp. 133–134. ↑ Torres Sevilla-Quiñones de León 1999, p. 417. ↑ Martínez Díez 2005, p. 161. ↑ Mattoso 1981, pp. 106 and 145.